How to Be a Latin Lover relies on a somewhat outdated stereotype to take audiences on a predictable journey, however mildly amusing the results. The film has an opening sequence of shock humor followed by a basic premise that feels best suited for Adam Sandler’s production company, before evolving into a feel-good family comedy. After the death of their hard-working father, a brother and sister take diverging paths with their lives. Sara (Salma Hayek) believes their father’s message of hard work, as a widow and single mother chasing the dream of one day becoming an architect. Maximo (Eugenio Derbez) takes a different approach to life after watching his father tragically die as a result of working too hard, deciding that he wants a life of luxury, without any hard work. As the title implies, Maximo develops skills of seduction as a young man, but only uses them on older women with large fortunes. He quickly marries a rich senior citizen bride in Peggy (Renée Taylor), taking advantage of her wealth without putting any work in maintaining the relationship. When his good looks begin to fade after 25 years together, Peggy trades Maximo in for a younger man (Michael Cera, in an odd casting choice), leaving him with no assets or skills. From the moment superficial Maximo moves in with his wholesome sister and her young son, Hugo (Raphael Alejandro), we know exactly where this film is headed. Despite an obvious character arc for Maximo, How to Be a Latin Lover takes its time redeeming the protagonist, forcing the audience to endure his abominable behavior for far too much of the nearly two-hour run-time. Even interspersed with occasionally effective slapstick humor and a long list of supporting actors in quirky roles, How to Be a Latin Lover overstays its welcome by attempting to fit too many tones and styles of comedy in one movie. Some of it works fantastically, but the overall journey is uneven and far too long for a film this silly. It isn’t just the different types of comedy which seem to be attracting various audiences, but also the casting choices. Derbez has played many bit roles in American comedies (many of which were produced by Sandler, who surprisingly has no involvement in this film), but is best known for his work in Mexican cinema. By making this film bilingual in many sections, it is clear that there was an attempt to market the film to several demographics, and that may be the most successful of the film’s marketing decisions. Directed by Ken Marino, there is also no shortage of familiar American comedy actors in the cast, including Rob Lowe as Maximo’s friend, Kristen Bell as the manager of a frozen yogurt shop that takes pity on the skill-less trophy husband, and two lunkheads Maximo owes money, played by Rob Riggle and Rob Huebel. Even when these characters add humor to the film, however, the effort to include so many recognizable faces in the cast has resulted in an overstuffed film. Surprisingly, How to Be a Latin Lover works best when it is being sincere, rather than trying to force laughs out as many areas of the narrative as possible. The heart of the film is in the familial relationships, both with Maximo’s efforts to win back his sister’s trust and in his growing affection for his young nephew. Unfortunately, much of the run-time makes it clear that Maximo’s primary reason for getting to know his nephew is due to the connections the young boy has at the private school he attends. Although he claims to be helping Hugo get invited to the birthday party of a cute young classmate, he is more interested in getting himself an invitation so that he can put the moves on the girl’s wealthy grandmother (played by Raquel Welch). Even if he is predictably redeemed (somewhat) by the end of the film, Maximo is a bit too despicable to root for during much of the film. It works for the silly comedy, but ends up being counterproductive to the film’s feel-good elements. 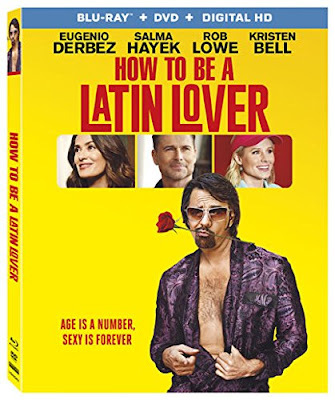 The Blu-ray release of How to Be a Latin Lover comes in a combo pack with a DVD and Digital HD copy of the film, along with a number of extras on the disc. Proving that the lengthy film could have been even longer, there are a handful of deleted and extended scenes included. There are also two featurettes and a commentary track. The commentary includes director Marino along with producer Ben Odell and Editor John Daigle.